Icemule Trace is a frontier settlement located in the northeastern region of western Elanith, in the shadow of the Dragon Spine Mountains to its east. Icemule, as it is commonly referred to, was founded by Paradis halflings with hopes of it becoming the gaming and entertainment capital of Elanthia. 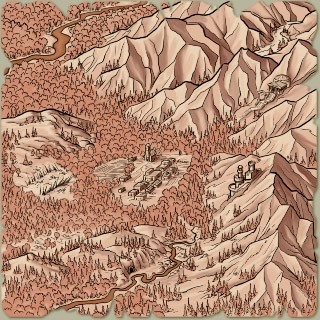 It has evolved into the usual base camp for adventurers travelling beyond it to the north, to Pinefar and The Rift. The well on Ale Street in the southwestern quadrant of town and the Town Center are frequented by adventurers, and between the two, nearly any skill or service can be traded for if there are others present who are capable of providing it. Citizens of Icemule colloquially refer to themselves as Icemulers, while they use the adjective Icemulian to describe that which is distinct to the region (i.e., Icemulian flora). Travelling merchant caravans and fairs often visit Icemule Trace during the winter months. In Charlatos 5119, the town held the first street festival in its history, the Faire of the North, featuring carnival-like fairgrounds, shopping, games hosted by the White Haven and the local Meeting Hall Organizations, a variety of professional merchant services, and a costume gala. Icemule Trace operates on a democratic election system, with most elected officials coming from upstanding halfling families. Mayor Fizelgrauf Binnder retired in 5108, resulting in the 5108 Icemule Mayoral Race. Nihala Winterberry defeated Igerone Furryback in the election and served as the mayor of the town for nearly a decade. In late 5117, Mayor Nihala disappeared from the public eye, allegedly due to a "curious malady". Hibbits Hoft was appointed as interim mayor. In early 5118, a cursed Nihala revealed that she knew she must sacrifice herself for the good of the people. She was killed when the prisoner Daukhera Darkflorr escaped from her magic-proof cell, thus launching the story The Dawn of Daukhera (called The Troubles by the locals). In Ivastaen 5118, it was announced that Icemule Trace would have the opportunity to elect a player character as mayor. Neovik, Joskin, Sabotage, Kilded, and Tawariell threw their names in the hat. After votes were counted on 22 Lumnea, Tawariell was announced as the new mayor. She, like all future mayors, will serve a two-year term and is not eligible for re-election. Few travellers can think of the Icemule Trace region without shivering. Snow is a near constant and when there's no snow, ice takes its place. Harsh weather aside, the beautiful landscape of trees can be quite peaceful to view. Nature is as unforgiving as it is peaceful however so travellers should make a beeline for the town of Icemule Trace to get proper supplies and travel advice. One wonders what drives a man or woman to venture into the frozen north to live. Shivering temperatures, harsh weather, unspeakable creatures, yet some call it home. 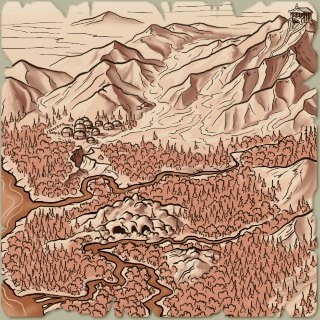 Only the bravest of adventurers make their way to this region, most to set foot upon Elanthia's tallest mountain, known as the top of the world. Others to go beyond even that, testing their limits to the very end of the realm. What lies beyond? Only those that have returned can speak of it and you will often find them here. Whether it be the lands of ice and snow to the southwest or the frozen glacier to the northeast, you can be certain that no matter where you go, it will be cold. Many dangerous creatures make these harsh lands their home. Few can be found that will hesitate before attempting to make a meal of you. Points of Interest: Icemule Pioneer Cemetery, Abandoned Farm, and Ice Tunnels. Rumors: The dreaded ice Halfling. No one talks about them. No one has seen them. Why?! In the forest south of the Trace rests this beautiful vale where the fall of the snowflakes is constant. It is difficult to determine whether this is due to new snow or simply existing snow from the tops of the trees set free by the wind. Rumors: It is said that lovers come to the vale where they each catch a snowflake on their tongue and then kiss, binding their love with nature for all time. The air of mystery surrounds this fort just east of the Trace. Every wall, tower, tunnel and stairway has been carved out of ice and snow. Signs of battle still remain though no one remembers what battle took place within the icy stronghold. Rumors: Legend speaks of a band of renegade dark elves that used the fort as shelter to hide from an angry phantom dragon. However, no one has ever claimed to have seen a phantom dragon. Even those who tell the tale say that the elves could not see the dragon, only that they knew it was almost upon them. Thus, there is very little worry that the dragon exists within the region though it remains a popular story. The Temple of Hope which rests in the Abbey northeast of the Trace was once a symbol of peace and good will throughout the lands. Unfortunately, darkness befell the inhabitants and all that remains are evil and the echoes of what once was. Rumors: Some say the there were survivors of the ill-fated Abbey and that they hope some day to return to free the place from evil. This fascinating structure rests on an island in a lake, each of which is entirely underground! Found deep within the caverns below Icemule Trace, one wonders whether Thurfel built the keep to protect something or simply to mystify visitors. Rumors: Strange glyphs with unknown magical properties can be found within the keep. Their nature has not been fully determined. Stark reminder of wars long forgotten, this Frozen Battlefield lies hidden within the snowy hills just west of Icemule Trace. Removed from history, its legacy reveals the chaos and disarray that is the gift of war and conflict. Points of Interest: Ice Plains, Amasalen's Shrine. Rumors: Evidence suggests that the battles in this region may have been part of a civil war between opposing sides of a great nation. Sadly, the only winner remaining is the chaos of the land and the scavenging trolls. The harsh wintery weather becomes almost bearable amongst the natural beauty to be found in Olbin Pass. Far northeast of the Trace, Olbin Pass serves to be the safest crossing point for climbers on their way to Pinefar Trading Post and Mt. Aenatumgana. A natural hot springs fed lake brings a little warmth to the frozen scenery to be found throughout the area. Rumors: A local halfling trader claims that the steamy oval lake is actually the home of a rare steam dragon that lives deep below. Although he can offer no real evidence, he does have several drawings of the beast that he is willing to sell at bargain rates. Pinefar Trading Post is your last chance stop for supplies deep in the northern mountains of Elanith. North of Icemule Trace and nestled near the base of Mount Aenatumgana, this mountain outpost services the boldest of adventurers on their way to the Top of the World and infamous Rift. Founded by halfing entrepeneur Belle with help from her father, the outpost offers a host of services with local flair such as an herb store, banker, gembuying, cigar shop, bar and Mimi, the outpost's Abyssinian cat. Few haven't heard of the local elven herbalist, Celk Fyretryst, who brews several special blends of teas that can heal most any wound. High in the northern slopes south of Pinefar Trading Post, the trees of the forest become strong and thick. So thick, they block the shrieking winds from assaulting the ears of the inhabitants. The calm created by this effect is the inspiration for the Quiet Forest. Rumors: Late in the evening, around midnight, the spirits of the forest are said to gather here sharing their visions of the day with one another. Situated halfway between the town of Icemule Trace and the Pinefar Trading Post, these alluring, yet dangerous, mountains have claimed many a trader's life. Beautiful arrangements of snow-covered rocks and frost-laden trees combine to give the surrounding wilderness an almost bewitching aura of tranquility. However, the snow-covered rocks conceal many loose footholds and the forests are home to many types of predatory wildlife. Adventurers who wish to return home in one piece would do well to keep their attentions focused. A breathtaking vista is to found atop a cliff overlooking the rushing River Olbin. All aspiring sightseers should take special precautions when climbing this cliff, for the long fall down into the icy Olbin is not for those of weak constitution. Few places reflect a greater air of vileness than the Dark Caves atop the Northern Mountains. You'll find no endearing qualities within, no massive caches of treasure, no hidden altars of great power. What you will find is carnage, decay and danger, the perfect thing for the adventurer who has everything. Rumors: These caves were said to hold a curse on those who brought the mighty to the honor of the forsaken. Honestly, this is the most confusing rumor we've encountered in these northern parts. Treacherous terrain, foul winds, inclimate weather and deadly creatures all come together to form this great wound in the land known as Nightmare Gorge. The best recommendations that can be given are those that suggest you avoid this collage of danger. Unfortunately, passing through the gorge is the only known route to Pinefar and beyond. Rumors: Dead or alive, everything that moves in the gorge is likely to kill you. This is no rumor. Ice and snow, ice and snow, in the northern parts you'll see quite a lot of this and the Arctic Tundra northeast of Pinefar is no exception. Perhaps the best thing to be seen aside from all the ice and snow is the view of the ice spires which are still far in the distance, but can be seen fading in and out through the snowstorms. Rumors: Thousands of years ago, this area sat at the bottom of the ocean, surrounded by sea life of all kinds both great and small. Sadly, in the present, there's just a bunch of ice and snow. Resting on the top of the world, Mount Aenatumgana watches over everything as if a king on his throne, calm and powerful. Glacial ice prevails across the mountain leaving only a few small trails for the bravest of adventurers to traverse. Brave they must be as these trails provide the only path to the Drake's Shrine. Rumors: Young mothers are often heard to tell their children that if they attempt to climb Aenatumgana, the mountain shall claim them as their own and change them into Ice Golems! One wonders if there is some truth to this rumor. Few places of honor to the gods can be said to hold a candle to the great shrine of Koar. It rests upon the top of the world at Mount Aenatumgana. Immense and beautiful, this shrine can only be visited by the bravest and cleverest of adventurers. Rumors: True to the nature of the gods, it is rumored that a portal to a realm of great peril, a place of strange structure and shifting horizon, lies protected deep within the shrine. Don't go there. It's too dangerous and you will die and probably kill the clerics that try to save you. Just say no! Rumors: There are no bananas so eat up before you go. This page was last modified on 10 March 2019, at 22:37.